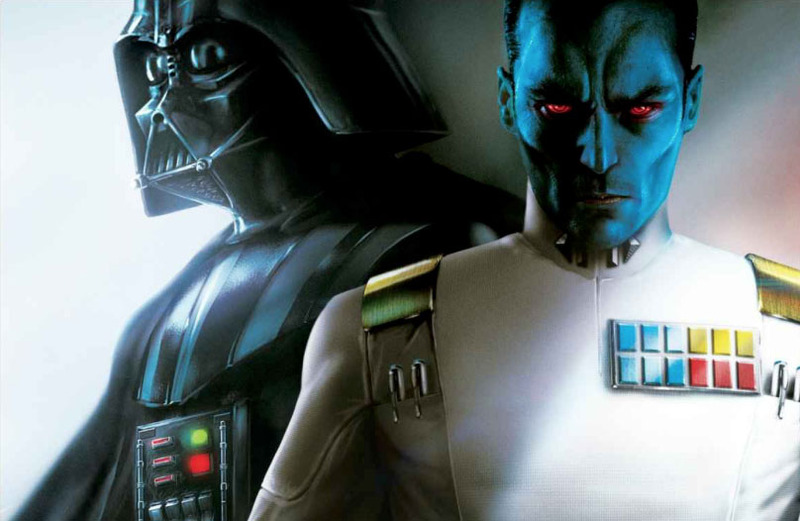 'Star Wars – Thrawn: Alliances' review: If you like Thrawn, you'll love this book – AiPT! One of the most recent adult-geared Star Wars novels to be released is Star Wars – Thrawn: Alliances by the original EU author himself, Timothy Zahn. Zahn returns to the Star Wars canon universe with the second canon Thrawn novel following the first Thrawn novel and taking place in the middle of Thrawn’s appearance on the Star Wars: Rebels cartoon series. Within the first Thrawn novel (I’ll just stick to the canon Thrawn novels from here on out, so the “first” novel was the only other Thrawn novel in canon) it was alluded to that Thrawn and Anakin Skywalker have had some sort of interaction during the Clone Wars, however it was not expanded on at that time, nor were there any other stories that explained that interaction. Well, the time has come to explain that mystery. The novel is divided into two main time periods, a “flashback” section and the “current” section. The “flashback” section of the novel is also split between two perspectives that happen late in the Clone Wars, shortly after Ahsoka has left the Jedi Order. One follows Padmé as she goes off on her own adventure trying to rescue one of her former handmaidens who has gotten herself into some trouble. The other part of the “flashback” sections follows Anakin and a strange blue alien, Commander Mitth’raw’nuruodo of the Expansionary Defense Fleet of the Chiss Ascendancy, or “Thrawn” for short, as they try to find Padmé after she had gone missing. The “current” portion of the novel involves the now Grand Admiral Thrawn, after he lost some of the Rebels as they escaped Chopper Base during the Season 3 finale of Rebels, and Darth Vader as they try and track down a danger that the Emperor has felt towards the Unknown Regions. The mystery of what has the Emperor so worked up that he sends both Thrawn and Vader out into the Unknown Regions plays out throughout the novel and is the main driving force of the story, however since much of the resolutions of that mystery feed into other mysteries along the way, I don’t want to give any of them away for readers wanting to discover them for themselves. Each section of the book works as its own mystery but they all end up intersecting in the end. Padmé is off to find her handmaiden and discover what she has been getting into. Anakin goes off to try and find her and eventually gets caught up in her investigation. Then you have Thrawn and Vader about 20 years later searching for something seemingly completely unrelated but eventually gets tied back into the events of the Clone Wars. It’s rather intriguing and had me constantly going back into the book wanting to learn more about what is going on. But even though the characters are basically the same Thrawn and Anakin/Vader, since the names of the characters can be emphasized differently; i.e. “Admiral Thrawn” or “Anakin,” it helps with the time jumps. With only a well placed word here or there, Zahn instantly takes you mentally to the time period you should be in. The time jumps, although similar in style to how Last Shot was set up, were much better executed here. Zahn is always able to set the scene for you with only a couple of words so that you instantly knew what and where the characters were and what was going on. Timothy Zahn has written a lot of books for the Star Wars franchise and is often credited as one of the better, if not the best, novel writers of the series. He has had some weaker books within the Legends continuity but overall I personally have enjoyed his works immensely. You would think that Thrawn: Alliances would be a direct continuation of his previous canon novel, Thrawn. However, the original Thrawn novel dovetailed directly into Thrawn’s initial appearance in Rebels, the first episodes of Season 3. Smartly, since this current novel Thrawn: Alliances doesn’t take place until after the Battle of Atollon (Chopper Base), there are no directly connecting threads between the books. So a reader is able to pick up Thrawn: Alliances without having to have read Thrawn recently, or even at all, to get the full experience of the book. The one thing that was my absolute favorite part of the book though was when the characters went to Batuu. For those who don’t know, Batuu is the name of the planet that Disney is building for “Star Wars Land,” more accurately called Star Wars: Galaxy’s Edge at both Disneyland and Walt Disney World. The specific locality on Batuu at the parks is called Black Spire Outpost, and it is this station that receives a prominent role within the story, in both time periods. So much so, that I got the feeling that Zahn was sitting in the middle of the park and describing everything that we would see, from the design of the buildings to the bar that a good chunk of the action takes place in. I would say that it could be a bit much of a description overload, however I am so excited for the park that this only got me more intensely excited. I want to be there, listening to Zahn talk about the park, while walking around the buildings. Looking at the characters in the book it mostly breaks down to Thrawn and how he interacts with everyone, since he is in the majority of the book. It is hard to say if Thrawn could ever be out of character when Zahn writes him, because he is Zahn’s creation and he always knows exactly how Thrawn would act in any given situation and I got that feeling from him here. He seemed spot on and I loved how Thrawn would take a situation and work out the details. There is one specific scene where Thrawn is constantly jumping around in circles in hyperspace and I was thinking to myself, I know that Zahn has a plan for this but I honestly couldn’t figure out what it could be. But when the secret was revealed it made so much sense that of course that was what Thrawn was doing. And that’s how Thrawn works in a nutshell. He is a mystery when he is working out his problems, but his solutions seem so obvious after the fact that you wonder how you could doubt him. And bringing it back to the first novel, his reasoning for keeping his plans to himself make sense, based on how he was treated within the Empire on his rise to power. The best part of all of the character interactions was Thrawn butting up against Vader. They are both supremely powerful beings within the Empire, however there is always that threat that Vader could just end Thrawn with a flick of his wrist. We know that doesn’t happen because Thrawn comes back in the cartoon series after this point, but in the moment you stop and wonder how Vader is going to handle him. Vader was also a general in the Clone Wars, a part of himself that he refers to as “The Jedi,” so he is obviously a good tactician himself, a point brought up a couple of times in both time periods. And now you have a master tactician going up against Vader. How does this relationship evolve? How would Vader accept criticism? Could Vader even accept criticism? These are all points that come to bear within their relationship together. Zahn does some interesting things with the narration, some of which was a carry over from the first book. He gives us a view inside Thrawn’s head frequently as he analyzes people around him and their actions, trying to determine what they are feeling and how they respond to various stimuli. I rather enjoyed that part, however he also did a similar thing with Anakin/Vader by giving him an internal “Double Vision” monologue, which basically equated to them citing when and where an enemy was going to attack before they did. This was the Jedi/Sith sense of things before they happened and it got old. It got old real quick. I wasn’t a huge fan of the way it was written and I don’t like the concept all that much in general. I feel that it could have been done better by just going with a more typical externally based battle description without going into the characters’ heads like that. But for all the great things in the novel, this is a minor quibble at best. For my reading of the book I went to the audiobook version, which was read by the frequent Star Wars narrator Marc Thompson. Marc’s Thrawn was so spot on it was scary. It was like listening to Lars Mikkelsen (the voice of Thrawn in Rebels) read for the character in the novel. His Darth Vader was rather jarring at first, though. I felt Marc was way off at the beginning of the book but then shortly in to it, it sounded fine. I’m not sure if Marc got better and more into it as he went along or my listening of it just got used to it. Either way, Vader was fine through most of the book besides at the beginning. My only problem with Marc, and its a problem that is just my standard with Marc, is that all his female characters sound the same. I got throwbacks to other audiobooks read by him and I keep thinking it was other female characters, when really it is Padmé in this instance, not Leia, or any other of a variety of female voices he has done in the past. Anyway, the audiobook was generally superb, as most of them have been. When I compare the two Thrawn books I wonder which one is better. They are both so different from each other that they are hard to compare. This one works out as a mystery. What is going on? And how does that secret, when solved, lead to the next mystery? I am keeping a lot of these mysteries vague within the novel because the reveals along the way are so fun that I want the reader to get the full enjoyment out of the book that I did. Overall, I would put this book on par with the first Thrawn novel. It is not better, but it is not worse. They are both fantastic reads and some of the best adult fiction that have been put out in the new canon to date.